The F10A Boring Bar has been designed for standard and large capacity machine work. The spindle diameter is larger than that of the F9A. It has been increased to 3.25" (8.2mm) for extra heavy duty machining up to a 9" (230mm) bore size. Large sleeve cuts can be taken at high spindle rpm's, and in many blocks, one pass sleeve cuts are possible, which increases productivity. 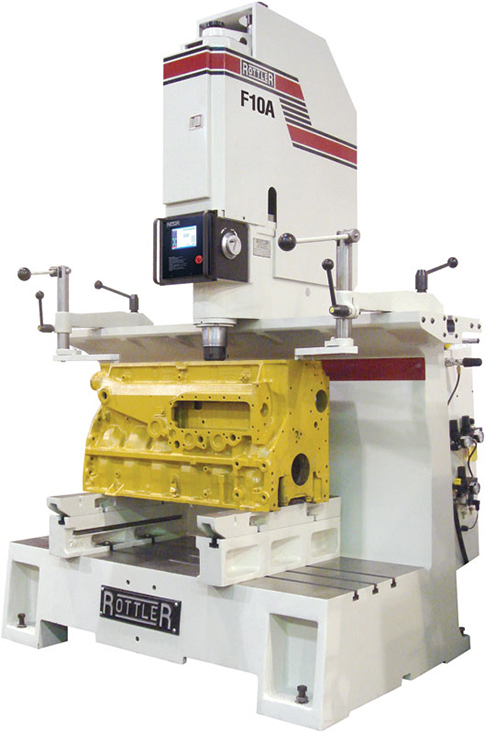 The massive one piece meehanite, stress relieved, precision machined base of the F10A model allows the fixturing of large diesel blocks such as Cummins 855, Detroit 12V71, Mercedes 44V12 and odd jobs such as gear cases and connecting rods. The F10A machine can also handle small jobs down to 1.5" (38mm) bore diameter with optional cutterheads. Floor-to-floor bore a V8 block in 15 minutes. Bore through a 6" (152.4mm) bore 4" (101.6mm) in diameter in 35 seconds, .250 sleeve cuts are not a problem. Tooling is available from 1.500 to 9 inches in diameter. Straight through and blind hole boring tools are available. Precision ball screws on the feed give the ultimate feed control.